Memorial Day is officially celebrated on the last Monday during the month of May in the U.S.. This day is dedicated to service men and women who gave their lives for freedom and country. It is also a time to remember loved ones who have passed away. The roots of Memorial Day observance, goes back to 1865 and the end of the Civil War. Some beloved blues artists that passed away in the last year include Bobby "Blue" Bland, Ann Rabson, T-Model Ford, Morris "Magic Slim" Holt, Jimmy Dawkins, Alvin Lee, Bobby Parker, Chick Willis and Precious Bryant. We thank them for their precious gifts, too. At least eight festivals are happening this weekend from California, to Nevada, to New Mexico, to Kansas, to Minnesota, to Louisiana to Mississippi and Alabama. 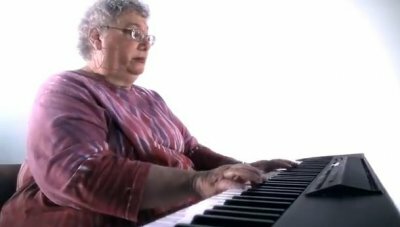 Birthdays of note this week: May 26 Mamie Smith (1883), May 27 Junior Parker (1932), May 28 T-Bone Walker (1910) and ...Kaati our dear BFG publisher. 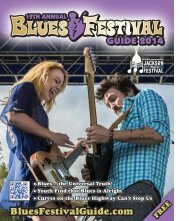 100,000 copies of the 12th annual Blues Festival Guide magazine are currently being shipped and will be distributed for free throughout U.S. and Canada to mainly Blues Societies and Blues festivals. You can also order here. 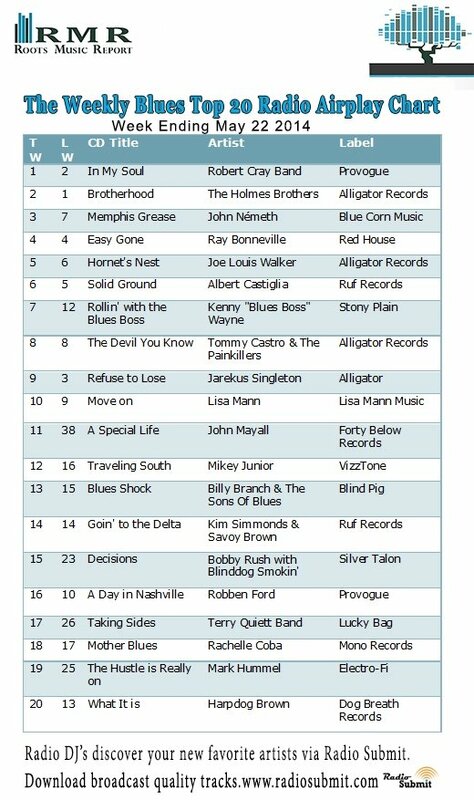 (lt-rt) Laura Chavez, Ronnie Earl and Candye Kane sharing the new Blues Festival Guide magazine at the Blues Music Awards in Memphis, TN, May 8th! "Bring Your Fine Self Home"
The 25th Annual Simi Valley Cajun & Blues Music Festival will be held on Saturday and Sunday of Memorial Day weekend, May 24th & 25th, 2014. 2014 promises to continue our tradition of bringing fans a full weekend of nonstop award-winning entertainment, more food choices than you can sample in two days, and activities to keep kids of all ages entertained too. The Cajun & Zydeco Stage will showcase continuous music each day featuring the best Cajun, Creole and Zydeco music acts. The Blues Stage will feature some of the most talented and renowned Blues & Roots acts in the world both Saturday and Sunday. Both stages feature lots of viewing space plus large dance floors. In addition, this family friendly event has a giant kids area featuring bouncers, rock walls, specialty acts, crafts and talent shows. There are also food booths and many crafts and merchandise booths. 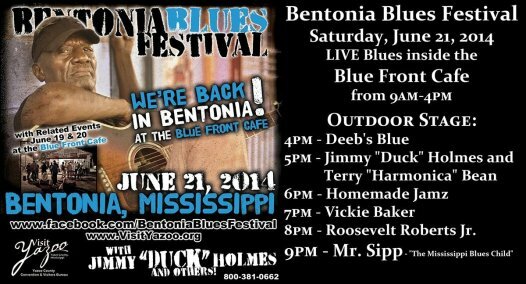 The Bentonia Blues Festival is heading back to Bentonia at the Blue Front Cafe! The 42nd Anniversary of the Bentonia Blues Festival is Saturday, June 21st in Bentonia, Mississippi. Admission is FREE! This authentic country blues festival is once again bringing folks from all over the world to Bentonia, so don’t you miss it! LIVE Blues ALL day, June 21st starting at 9am, inside of the Blue Front Cafe! LIVE Blues on the outdoor stage starting at 4pm! The festival is named after Pop Ferguson who was inducted into the U.S. Library of Congress and the Folkways Museum of the Smithsonian Institute six years ago. 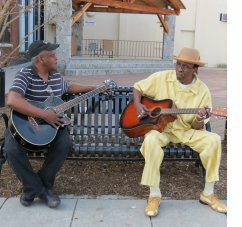 In 2015, he will be formally recognized during the opening of the new African-American museum in Washington, D.C.His son, Clyde, founded the Pop Ferguson Blues Heritage Festival six years ago and plays bass guitar with his dad. It’s hard to find fault when your destination is a beautiful park on a beach with 25 sizzling acts and the weather cooperates, too. 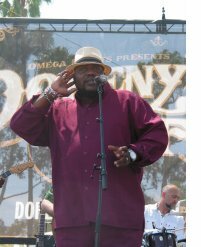 With three stages of a variety of blues, rock and soul, there was something for everyone May 17-18 in Dana Point, California. There are huge video screens at the main stage so you can see what’s going on “bigtime” even from a far. The Sailor Jerry Stage is very large, too and the grassy audience-area slopes up to a picnic patio for a bit of an amphitheater view. The Backporch Stage is more intimate (yet always packed) and maybe more theatrical in that acts seem to possibly feel more loose there! People.com - He woke up this morning … and again this afternoon following his nap. Two-year-old Luca, from Barcelona, comes by the blues naturally. 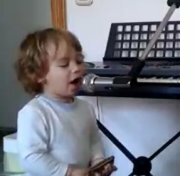 His dad is the leader of blues band "Tota Blues," and so Luca's grown up feeling the spirit, as can be seen from this clip. With Luca's mom a singer, too, he's got quite the musical background. But the feeling he puts into his performance is something that can't be taught. And Luca actually can stay in something approximating real pitch and time with his "singing." True, he's not speaking any recognizable language, but the blues transcend all language (and age), don't they? Oh, and did we mention he also plays the harmonica? 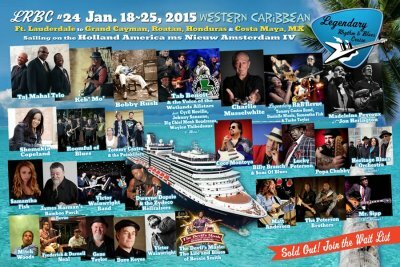 The hottest ticket in the Blues, The Legendary Rhythm & Blues Cruise, which sails on the high seas twice a year, is hosting their Annual Cruiser Reunion shows for 3 nights this year (May 23-24-25). Based in Kansas City, the LRBC is the brainchild of Roger Naber, (former co-owner of the Grand Emporium live music venue) who is also celebrating 35 years as a music promoter in tandem with the music on stage. With the next two sold-out, upcoming LRBC's, Kansas City music fans will have an opportunity to see six varied internationally famous acts at the well known and respected Knuckleheads honky-tonk venue. 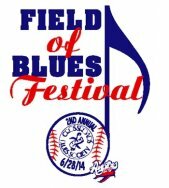 Crossroads Blues Society’s Field of Blues Festival will open its gates at 11 a.m. June 28 at Rockford Aviators Stadium in Love Park, Illinois (4503 Interstate Blvd). The all-day festival will be headlined by John Nemeth and will feature international artists, including an act from New Zealand. 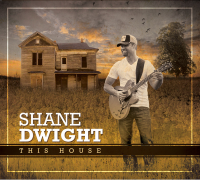 All proceeds from the festival will support the Crossroads Blues in the Schools program. 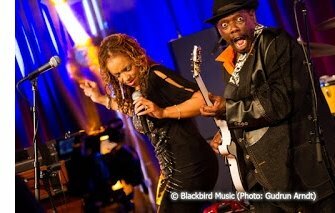 Here are some links to photos from the recent Blues Music Awards. Summer is a time of wall-to-wall music festivals, even in places where there aren’t any walls. Like outdoors. Coming up on the Bluesmobile: Blues Festivals with a foreign accent. 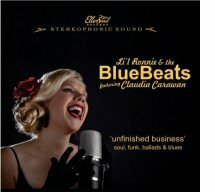 Including music from Gregg Allman, Eric Bibb, Kent Burnside, Coco Montoya, and more. 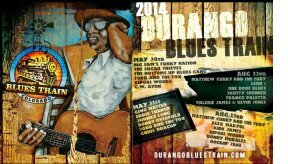 Blues festivals from around the world. Next time in the Bluesmobile.